Car Accidents – Insurance Matters. A 44-year-old woman died at the scene after a hit-and-run car accident involving 7 vehicles last night on I-182 between Road 68 and Road 100. She was driving eastbound in a Jeep Grand Cherokee when she was hit by someone driving a blue Chrysler Sebring. The Sebring was totalled and the driver fled the scene on foot. The impact forced her Jeep across the median and into oncoming traffic in the westbound lanes where she was then struck by five other cars. Four other people were injured and transported to local hospitals. Today, the Washington State Patrol arrested the suspected driver and have booked him into Franklin County jail on multiple felony charges. Car accidents happen all the time. This story is especially gripping because the accident was so serious and because the at-fault driver fled the scene. We all want justice. But justice does not bring the innocent driver back. It usually doesn’t even pay the bills. It may satisfy us, the general public, but what about those involved and their family? What kind of insurance could help? Uninsured Motorist Coverage. Because the driver fled the scene we can guess he probably was not responsible enough to carry insurance. Even if he did, would he have enough? 6 cars damaged. One person dead. Four others taken to the hospital. Even if he did have insurance, odds are good he does not have enough to cover all the injuries and property damage he caused. That is why Uninsured Motorist (UM) (which is also Underinsured Motorist in Washington state) is so important. Your insurance company will cover you just as if the guy had the same insurance you have with your company. UM can cover both bodily injury to everyone in your car as well as covering the damage to your car. Don’t depend on someone else’s insurance to take care of you. Take care of yourself and your family. Make sure you have Uninsured Motorist coverage. Life Insurance. We never know when it is our time. Whether caused by someone else like this accident or not. Life insurance will make sure that those left behind will be able to continue without hardship (and not having to do a GoFundMe). You can decide how much coverage you need to provide. From just enough to cover funeral expenses or enough to make the house payments and put the kids through college like you planned. The insurance business makes you look at accidents in a different light. But it also puts you in a position to help people before and after the tragedy happens. 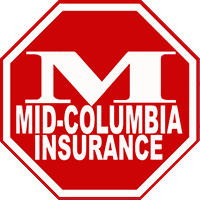 At Mid-Columbia Insurance we help get you the coverage you want at a price you can afford.